The 880 Series portable hot tubs are superior to any others in design and performance. From the AquaTerrace™ waterfall to the MicroClean water purification system, a portable spa from the 880 Series comes equipped with the best. And if your idea of the best is like ours, you'll want to add enhancements, like SunScents aromatherapy. The 880 Series spas lead the portable hot tub industry. The ultimate Sundance® hot tub. The all new Aspen™ spa lives up to the 880™-Series’ reputation as the most luxurious portable hot tubs in the world. Equipped to deliver the healthy benefits of hydrotherapy in an entertaining package. The best of everything in a hot tub is here: a foot dome with eight massaging jets; patented Fluidix™ jets for the neck: 66 jets in total. At night, the SunGlow™ LED lighting system illuminates this gracefully styled, spacious spa. The new slim designed foot mount combined with a wider footwell is designed for easy movement into and out of the ergonomically designed seats. As both an outdoor entertainment center and a therapeutic spa retreat, the Sundance Aspen stands alone as the luxury leader. Learn more about the Sundance Aspen. Optima is the perfect spa, by the pool or by itself. 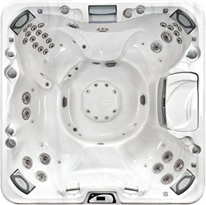 Hey look, everybody's here-sized is one way to describe the big, beautiful Optima spa from Sundance Spas. With seating for seven, a cascading AquaTerrace waterfall, and massaging jets from the reflexology foot dome, this large hot tub brings the Sundance spa lifestyle to your backyard. 47 jets deliver an impressive range of massage variations. Unique wrap-around ComforTone headrests cradle your head. There is a built-in aromatherapy system for adding SunScents fragrance, and programmable LED lighting. So when everyone shows up, get out of the house, and into your own large hot tub: the Sundance Optima spa. Introducing the ultimate Sundance hot tub. The Maxxus. Our flagship spa is loaded with the best in Sundance hot tub technology to deliver awesome hydrotherapy. It features 57 jets, including the best in the industry, patented Fluidix jets. There are two AquaTerrace water features. Multicolor, programmable SunGlow LED lighting. A new synthetic base that stands up to virtually anything. And an optional SunSound stereo system with a built-in docking station made for iPod® and an MP3 jack, so you can play your own soundtrack as you unwind. The Cameo spa gets a Best Buy rating from Consumers Digest. The Sundance Cameo spa has everything you're looking for: lots of space, famous Sundance hot tub hydrotherapy, and exclusively for the Cameo and Optima models, new look cabinetry. Just some of the things you'll find in the Cameo spa: a full-body lounge for a total body massage, with special jets for the wrists. A deep, jetted footwell. Fun options like the Bluewave stereo with bluetooth connection to your device. And for a comfortable transition between the warm temperature of the water and the temperature of the air, the Cameo hot tub comes with a cool-down seat. The Sundance Cameo spa. Attitude adjustment has never been this easy. Your hydrotherapy hot tub retreat also loves to party. Welcome to Altamar, the hot tub that doubles as a private hydrotherapy spa and the perfect gathering place for you and your friends. For a stress-reducing experience, let the exclusive, patented Fluidix jets in this hydrotherapy spa work their magic to release muscle tension. Stretch out in the ergonomically designed full-body lounge, and feel the warm-water massage all over. But don't hesitate to invite the gang over for some quality time: there's room for six adults in this hot tub. You can set the Altamar's SunGlow LED lighting to just the right color selection, from tranquil to "party." When it comes to a hot tub with high-performance features and versatility, Altamar rises above the ordinary. Call it the best hot tub? Or the best spa? Call it what you will, the Marin spa captures the spirit of California's Marin County, a favorite getaway for locals. With its impressive selection of seven different types of jets, the Marin hot tub is definitely flexible. Soothing, calming, invigorating, the mood inside the Marin is whatever you make it. Relax in what is among the finest hydromassage seats in the industry, the Accu-Ssage therapy seat. Let the exclusive, patented Fluidix jets in this hydrotherapy spa release muscle tension. Add SunScents to the SilentAir injection system to perfect the experience. The Marin is also easy-care, thanks to MicroClean Plus filtration. Sit side-by-side and enjoy relaxing water therapy. Like its Mediterranean namesake, the Capri hot tub is the perfect place for intimate moments, carefree good times, and soothing warm water therapy. In the mood to share a warm-water massage with someone special? You can sit beside each other and revel in different but delightful hot water jet massages. Many of the jets in the Capri are adjustable, including the high/low impact, patented Fluidix ST jets. The hydromassage benefits go beyond the physical: water therapy in a Capri calms the mind and spirit. And with its illuminated waterfall, underwater lighting and digital control panel, Capri gives you the best in Euro-style warm-water therapy.